Physicians can choose from a number of revascularization procedures to enhance patients’ quality of life following a heart attack. Revascularization following heart attack constitutes a variety of procedures that help reestablish blood flow to the heart muscle that is fed by a blocked or narrowed artery. The ideal candidates for revascularization procedures are patients with ongoing angina or ischemia following a heart attack, particularly if a large part of viable heart muscle is at risk. For older patients it can be a matter of life and death. Catheter-based aortic valve replacement is another treatment that may be an option, though it’s still making its way through clinical trials in the United States. While it’s not a type of revascularization, it’s an emerging procedure used specifically to address narrowing of the aortic valve and is worth mention. For some patients, these revascularization treatments are not an option. A patient may have undergone a previous bypass, making a second procedure too risky. Or the blockages may be too severe for bypass alone to be effective. Or a patient may simply be too sick for major surgery. In these circumstances, transmyocardial revascularization (TMR) may be considered. After making the incision using a laser, the surgeon drills small holes from the outside of the heart into its pumping chamber, creating channels along the left side, Borchelt explains. It then allows oxygenated blood to immediately go out into the heart muscle or left ventricle. Most patients get at least two reductions in their [pain] score, says Borchelt. A class four, or chest pain at rest, may be able to be reduced to a two or even a one, which can be life changing for the patient. However, one important thing to note, Borchelt adds, is that there’s no proof this will extend a patient’s survival. This is a procedure likely to be performed on older patients considering they often have had previous surgeries and may no longer be candidates for future procedures. Though it’s less traumatic than some procedures, there are still situations in which TMR wouldn’t be recommended, says Borchelt. If the heart is too weak, drilling holes may be too much for the muscle to handle. Or if the patient has received radiation treatment to the chest as part of breast cancer treatment, it may make a procedure like TMR too difficult to heal from. In addition, if the patient is not a good candidate for surgery in general because of a condition such as severe chronic obstructive pulmonary disease or other chronic health issues, TMR would not be ideal, says Borchelt. Overall, heart revascularization procedures have proven quite successful in the aging population. In fact, a recent study published in the Canadian Medical Association Journal found that the use of invasive procedures such as revascularization in elder heart attack patients may be responsible for improved survival rates after one year. It also found that the use of such procedures in the aging population is increasing. That doesn’t mean, however, that all physicians are willing to operate on their oldest patients. Katlic says it’s not age that makes a patient a good candidate for surgery—or any other procedure for that matter. It really comes down to a patient’s overall condition. “The geriatric population is one of the most variable so you can’t just come up with an arbitrary number and say it’s too old for surgery,” he says. “There can be one 80-year-old patient who is very frail and has some memory loss and other issues. Another may be an 80-year-old who is running marathons. Cardiologists have learned over the years that there are ways to determine who is a good candidate for a procedure and who is not, and this is something physicians need to discuss with a patient and his or her family. When it comes to the geriatric population, it’s important to assess not only physical, but also mental status because studies have shown that mental status and mood play a huge role in recovery. “Their overall physical and mental condition should help make the decision on whether they can handle surgery and its subsequent recovery time,” Katlic says. A recent study highlights the importance of revascularization, which can be a life-saving procedure for many older adults. Published in the May 2010 issue of Catheterization and Cardiovascular Interventions, the study found that 28.8% of patients with significant coronary artery disease (CAD) who did not undergo complete revascularization had a higher mortality rate than those who did. Cardiologists from the Minneapolis Heart Institute Foundation and the University of Minnesota led the three-year retrospective study and reviewed angiographs and clinical data from 493 patients. After three years, study participants with incomplete revascularization had a 14.8% mortality risk compared with 6.6% of patients who had complete revascularization. 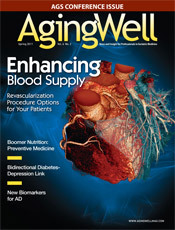 The team also found that patients with incomplete revascularization were older, more often male, and more likely to have hypertension, diabetes, peripheral arterial disease, and a previous history of CAD that included heart attack, percutaneous coronary intervention, and coronary artery bypass grafting. • Ageism sometimes precludes geriatric patients from being considered for revascularization procedures. However, the use of revascularization procedures in the aging population is increasing. • Revascularization procedures following elders’ heart attacks can result in improved survival rates. • Both physical and mental considerations contribute to appropriate assessment of a geriatric patient’s suitability for revascularization surgery. • Revascularization even in the very old can be successful in carefully selected patients. • Risks involved in revascularization in older patients vary with the procedure to be utilized.